In his 1904 preface to the Italian edition of Words of a Rebel, Kropotkin discusses the renewed militancy among European workers, and the embrace of the general strike as a means of revolutionary transformation. Soon thereafter, general strikes broke out, first in Poland, and then in Russia itself, as Polish and Russian workers rose against Czarist autocracy, leading to the 1905 Russian Revolution. Although the Revolution was ultimately unsuccessful, it proved but a prelude to the 1917 Russian Revolution, which led to the final overthrow of the Czarist regime. 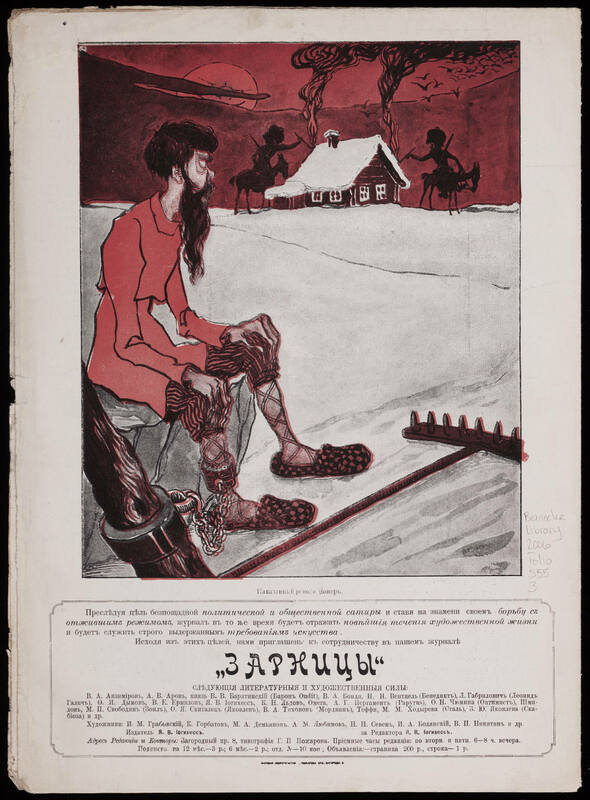 In this essay, “The Revolution in Russia,” first published in the Nineteenth Century magazine, Vol. 58, No. 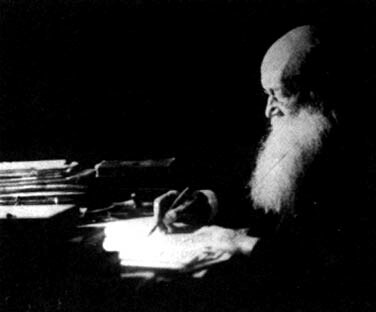 346 in December 1905, Kropotkin discusses the origins and development of the 1905 Russian Revolution from an anarchist perspective, emphasizing again the role of the general strike, as did Siegfried Nacht in his contemporaneous pamphlet, The Social General Strike, which was widely translated and distributed at the time. Events in Russia are following one another with that rapidity which is characteristic of revolutionary periods. Eleven months ago when I wrote in this review about the constitutional agitation in Russia, the Congress of the Zemstvos, which had timidly expressed the desire of having some sort of representative institutions introduced in Russia, was the first open step that had been made by a collective body in the struggle which was going to develop itself with such an astounding violence. Now, autocracy, which then seemed so solid as to be capable of weathering many a storm, has already been forced to recognize that it must cease to exist. But between these two events so many others of the deepest importance have taken place that they must be recalled to memory, before any safe conclusion can be drawn as to the probable further developments of the revolution in Russia. Modest though this declaration was, it became the signal for a general agitation. True, the press was forbidden to discuss it, but all the papers, as well as the municipal councils, the scientific societies, and all sorts of private groups discussed it nevertheless. Then, in December last, the “intellectuals” organized themselves into vast unions of engineers, lawyers, chemists, teachers, and so on—all federated in a general union of unions. And amid this agitation, the timid resolutions of the zemstvos were soon outdistanced. A constituent assembly, elected by universal, direct, and secret suffrage, became the watchword of all the constitutional meetings. 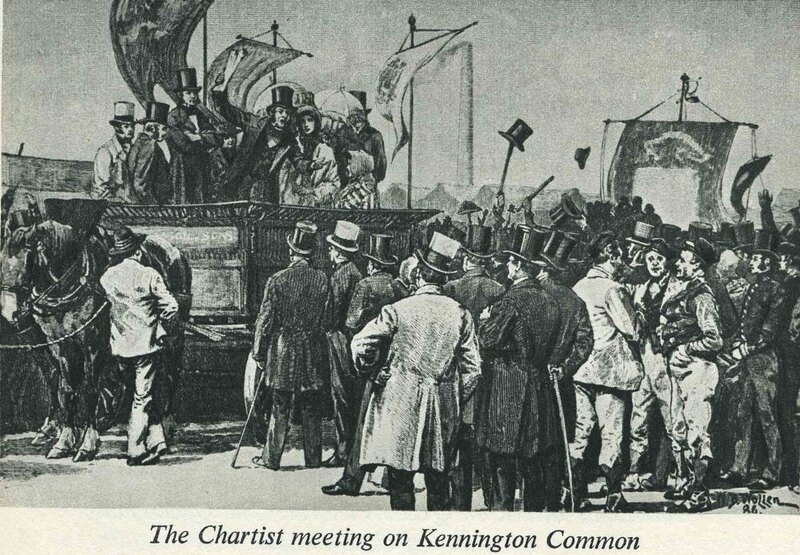 This demand was soon as popular as the paragraphs of the charter were during the Chartist agitation [in England 1836-1848]. The students were the first to carry these resolutions into the streets, and they organized imposing demonstrations in support of these demands at St. Petersburg, Moscow, and in all the university towns. At Moscow the Grand Duke Sergei [Aleksandrovich Romanov] ordered the troops to fire at the absolutely peaceful demonstration. Many were killed and from that day he became a doomed man. Things would have probably dragged if the St. Petersburg workingmen had not at this moment lent their powerful support to the young movement—entirely changing by their move the very face of events. To prevent by any means the “intellectuals” from carrying on their propaganda amid the workingmen and the peasant had been the constant preoccupation of the Russian government; while, on the other side, to join hands with the workers and the peasants and to spread among them the ideas of freedom and socialism had always been the goal of the revolutionary youth for the last forty years—since 1861. Life itself worked on their side. The labour movement played so prominent a part in the life of Europe during the last half-century, and it so much occupied the attention of all the European press, that the infiltration of its ideas into Russia could not be prevented by repression. The great strikes of 1896—1900 at St. Petersburg and in central Russia, the growth of the labour organizations in Poland, and the admirable success of the Jewish labour organization, the Bund, in western and south western Russia proved, indeed, that the Russian workingmen had joined hands in their aspirations with their Western brothers. There is no need to repeat here what Father Gapon has told already in his autobiography—how he succeeded in grouping in a few months a considerable mass of the St. Petersburg workers around all sorts of lecturing institutes, tea restaurants, cooperative societies, and the like, and how he, with a few workingmen friends, organized within that mass and linked together several thousands of men inspired by higher purposes. 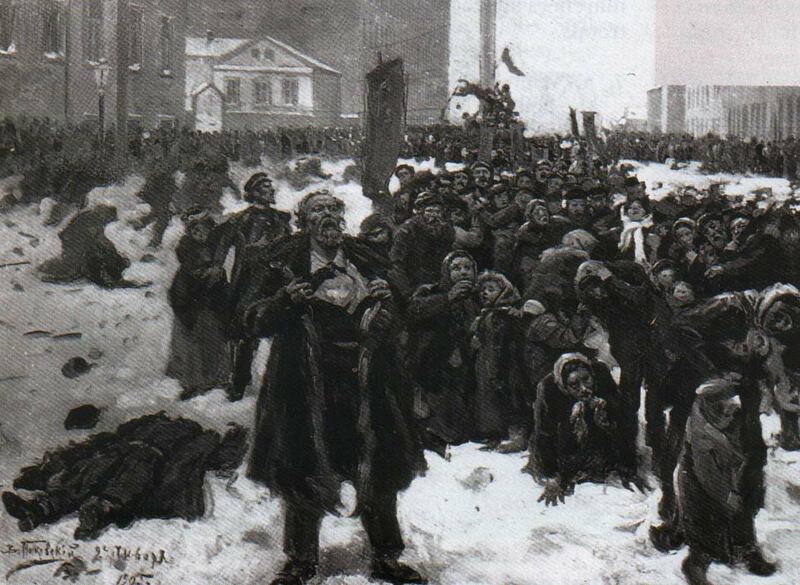 They succeeded so well in their underground work that when they suggested to the workingmen that they should go en masse to the tsar, and unroll before him a petition asking for constitutional guarantees as well as for some economic changes, nearly seventy thousand men took in two days the oath to join the demonstration, although it had become nearly certain that the demonstration would be repulsed by force of arms. They more than kept word, as they came out in still greater numbers—about two hundred thousand—and persisted in approaching the Winter Palace notwithstanding the firing of the troops. It is now known how the emperor, himself concealed at Tsarskoe Selo, gave orders to receive the demonstrators with volley-firing; how the capital was divided for that purpose into military districts, each one having at a given spot its staff, its field telephones, its ambulances… The troops fired at the dense crowds at a range of a few dozen yards, and no less than two to three thousand men, women, and children fell: the victims of the tsar’s fears and obstinacy. The feeling of horror with which eyewitnesses, Russian and English, speak of this massacre surpasses description. Even time will not erase these horrible scenes from the memories of those who saw them, just as the horrors of a shipwreck remain engraved forever in the memory of a rescued passenger. What Gapon said immediately after the massacre about the viper’s brood of the whole dynasty was echoed all over Russia, and went as far as the valleys of Manchuria. The whole character of the movement was changed at once by this massacre. All illusions were dissipated. As the autocrat and his supporters had not shrunk from that wanton, fiendish, and cowardly slaughtering, it was evident that they would stop at no violence and no treachery. Since that day the name of the Romanov dynasty began to become odious among the workingmen of Russia. The illusion of a benevolent autocrat who was going to listen paternally to the demands of his subjects was gone forever. Distrust of everything that might come from the Romanovs took its place; and the idea of a democratic republic, which formerly was adopted by a few socialists only, now found its way even into the relatively moderate program. To let the people think that they might be received by the tsar, to lure them to the Winter Palace, and there to mow them down by volleys of rifle fire—such crimes are never pardoned in history. If the intention of Nicholas II and his advisers had been to terrorize the working classes, the effect of the January slaughter was entirely in the opposite direction. It gave a new force to the labour movement all over Russia. 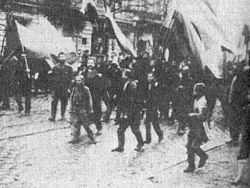 Five days after the terrible “Vladimir” Sunday, a mass strike broke out at Warsaw, and was followed by mass strikes at Lodz and in all the industrial and mining centers of Poland. In a day or two the Warsaw strike was joined by a hundred thousand operatives and became general. All factories were closed, no tramways were running, no papers were published. The students joined the movement, and were followed by the pupils of the secondary schools. The shop assistants, the clerks in the banks and in all public and private commercial establishments, the waiters in the restaurants—all gradually came out to support the strikers. Lodz joined Warsaw, and two days later the strike spread over the mining district of Dombrowo. 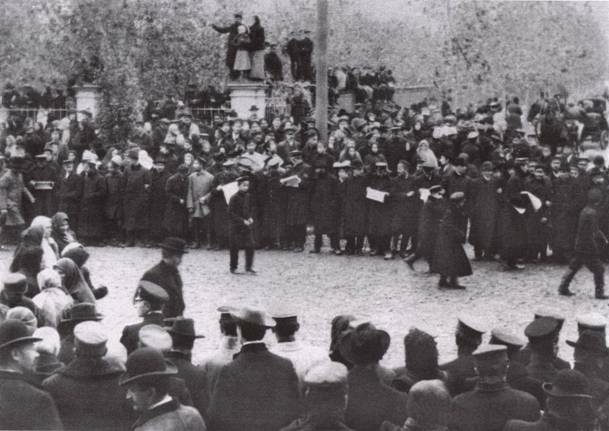 An eight-hour day, increased wages, political liberties, and home rule, with a Polish Diet sitting at Warsaw were the demands of all the strikers. We thus find in these Polish strikes all the characteristics which, later on, made of the general strikes of October last so powerful a weapon against the crumbling autocratic system. If the rulers of Russia had had the slightest comprehension of what was going on, they would have perceived at once that a new factor of such potency had made its appearance in the movement, in the shape of a strike in which all classes of the population joined hands, that nothing remained but to yield to their demands; otherwise the whole fabric of the state would be shattered down to its deepest foundations. But they remained as deaf to the teachings of modern European life as they had been to the lessons of history; and when the strikers appeared in the streets, organizing imposing demonstrations, they knew of no better expedient than to send the order: “Shoot them! ” In a couple of days more than three hundred men and women were shot at Warsaw, one hundred at Lodz, forty-three at Sosnowice, forty-two at Ostrowiec, and soon, all over Poland! The result of these new massacres was that all classes of society drew closer together in order to face the common enemy, and swore to fight till victory should be gained. Since that time governors of provinces, officers of the police, gendarmes, spies, and the like have been killed in all parts of Poland, not one day passing without some such act being recorded; so it was estimated in August last that ninety-five terrorist acts of this sort had taken place in Poland, and that in very few of them were the assailants arrested As a rule they disappeared—the whole population evidently helping to conceal them. This is the second part of Kropotkin’s essay, The Revolution in Russia, first published in the Nineteenth Century, Vol. 58, No. 346, in December 1905. 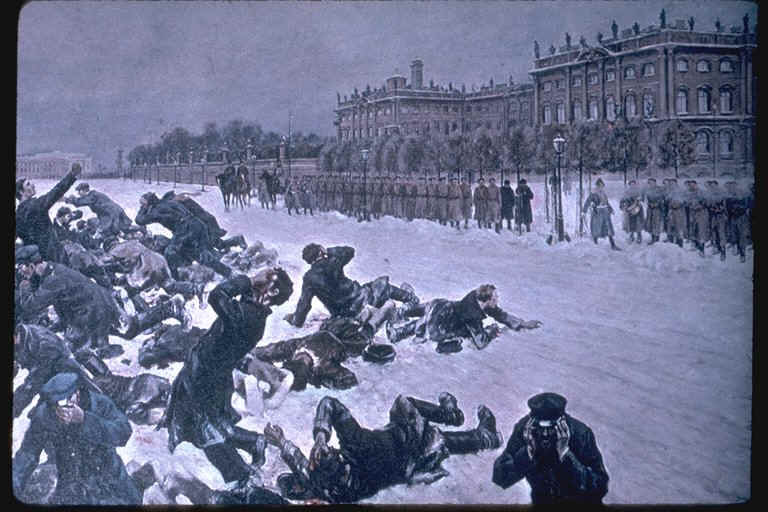 In Part One (see above), Kropotkin discusses how the January 1905, “Bloody Sunday,” massacre of hundreds of peaceful demonstrators at the Winter Palace in St. Petersburg led to a wave of mass strikes in Russian occupied Poland. In Part Two he discusses the peasant uprisings that were spreading across the Russian empire around the same time. This was seen as vindication of the anarchist view, rejected by the Marxists, that the peasantry had a significant role to play in the coming social revolution, a position that Bakunin had advocated during the 1870-71 Franco-Prussian War in his pamphlet, Letters to a Frenchman on the Present Crisis (Selection 28 in Anarchism: A Documentary History of Libertarian Ideas, Volume One: From Anarchy to Anarchism (300CE-1939)). In the meantime the peasant uprisings, which had already begun a couple of years ago, were continuing all over Russia, showing, as is usually the case with peasant uprisings, a recrudescence at the beginning of the winter and a falling off at the time when the crops have to be taken in. They now took serious proportions in the Baltic provinces, in Poland, and Lithuania, in the central provinces of Chernigov, Orel, Kursk, and Tula, on the middle Volga, and especially in western Transcaucasia. There were weeks when the Russian papers would record every day from ten to twenty cases of peasant uprisings. 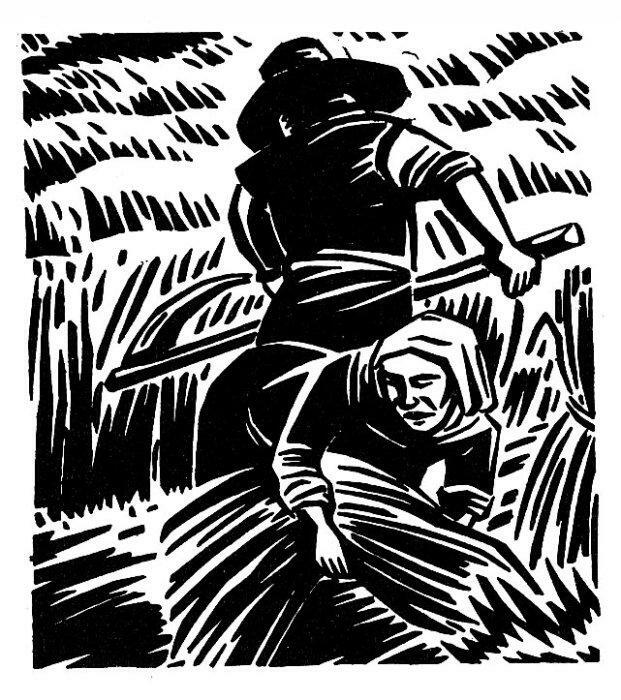 Then, during crop time, there was a falling off in these numbers, but now that the main field work is over, the peasant revolts are beginning with a renewed force. In all these uprisings the peasants display a most wonderful unity of action, a striking calmness, and remarkable organizing capacities, in most cases their demands are even very moderate. They begin by holding a solemn assembly of the mir (“village community”); then they ask the priest to sing a Te Deum for the success of the enterprise; they elect as their delegates the wealthiest men of the village, and they proceed with their carts to the landlord’s grain stores. There they take exactly what they need for keeping alive till the next crop, or they take the necessary fuel from the landlord’s wood, and if no resistance has been offered they take nothing else, and return to their houses in the same orderly way, or else they come to the landlord and signify to him that unless he agrees to rent all his land to the village community at some price—usually a fair price—nobody will be allowed to rent his land or work for him as a hired labourer, and that the best he can do is therefore to leave the village. In other places, if the landlord has been a good neighbour, they offer to buy all his land on the responsibility of the commune, for the price which land, sold in a lump, can fetch in that neighbourhood or alternatively they offer such a yearly rent; or, if he intends to cultivate the land himself, they are ready to work at a fair price, slightly above the now current prices. But rack-renting [extortionate rents], renting to middlemen, or renting to other villages, in order to force his nearest neighbours to work at lower wages—all this must be given up forever. 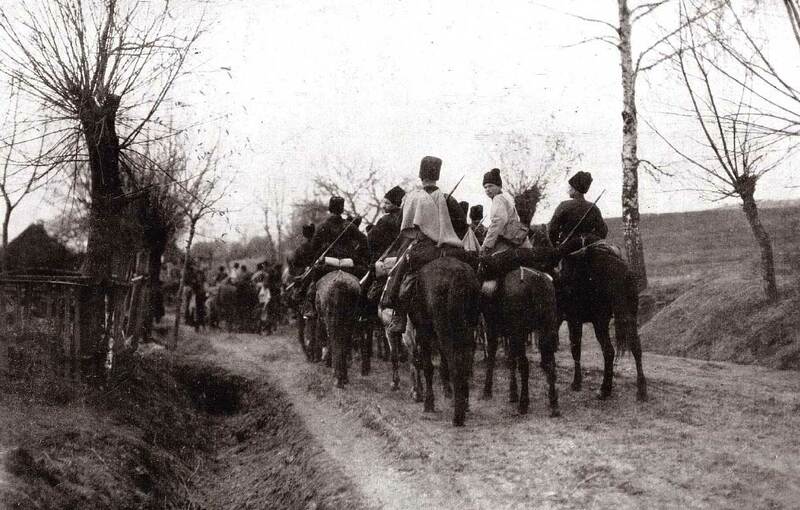 As to the Caucasus, the peasants of Guria (western portion of Georgia) proceeded even in a more radical way. They refused to work for the landlords, sent away all the authorities, and, nominating their own judges, they organized such independent village communities, embodying a whole territory, as the old cantons of Schwyz, Uri, and Unterwalden represented for several centuries in succession. 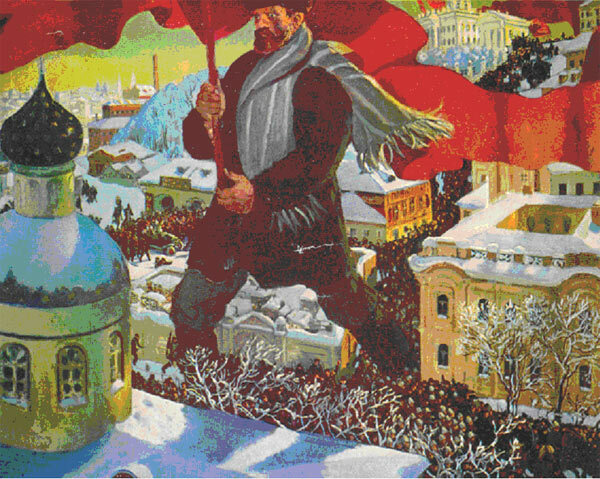 In Part Three of “The Revolution in Russia,“ Kropotkin discusses how the 1905 Russian Revolution spread throughout the Russian empire among all the oppressed groups and classes, only to be met by severe state repression. The peasants uprising alone, spreading over wide territories, rolling like waves which flood today one part of the country and tomorrow another, would have been sufficient to entirely upset the usual course of affairs in Russia. But when the peasant insurrection is combined with a general awakening of the workingmen in towns, who refuse to remain in the old servile conditions; when all the educated classes enter into an open revolt against the old system; and when important portions of the empire, such as Finland, Poland, and the Caucasus, strive for complete home rule, while other portions, such as Siberia, the Baltic provinces, and Little Russia, and in fact every province, claim autonomy and want to be freed from the St. Petersburg bureaucrats—then it becomes evident that the time has come for a deep, complete revision of all the institutions. Every reasoning observer, everyone who has learned something in his life about the psychology of nations, would conclude that if any concessions are to be made to the new spirit of the time, they must be made with an open mind, in a straightforward way, with a deep sense of responsibility for what is done—not as a concession enforced by the conditions of a given moment, but as a quite conscious reasoned move, dictated by a comprehension of the historical phase which the country is going through. Unfortunately, nothing of that consciousness and sense of responsibility is seen among those who have been the rulers of Russia during the last twelve months. I have told in my memoirs how certain moderate concessions, if they had been granted towards the end of the reign of Alexander II or at the advent of his son, would have been hailed with enthusiasm and would have paved the way for the gradual and slow passage from absolutism to representative government. Even in 1895, when Nicholas II had become emperor, it was not too late for such concessions. But it was also evident to everyone who was not blinded by that artificial atmosphere of bureaucracy created in all capitals, that ten years later—that is, in November last —such half-hearted concessions as a “Consultative Assembly” were already out of the question. The events of the last ten years, with which the readers of this review are familiar—the students’ affair of 1901, the rule of Plehve, and so on, to say nothing of the abominable blunders of the [Russo-Japanese] war—had already created too deep a chasm between Russia and Nicholas II. The January massacres widened that chasm still more. Therefore only an open recognition of the right of the nation to frame its own constitution, and a complete honest amnesty, granted as a pledge of good faith, could have spared Russia all the bloodshed of the last ten months. Every intelligent statesman would have understood it. But the cynical courtier, Bulygin, whom Nicholas II and his mother considered a statesman, and to whom they had pinned their faith, was not the man to do so. His only policy was to win time, in the hope that something might turn the scales in favour of his masters. 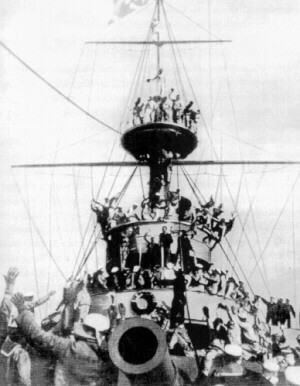 the mutiny on the ironclad Kniaz Potemkin; the second series of strikes in Poland, again followed by massacres at Lodz, Warsaw, and all other chief industrial centers; a series of uprisings at Riga, culminating in the great street battles of July 28—to say nothing of a regular, uninterrupted succession of minor agrarian revolts. All Russia had thus to be set into open revolt, blood had to run freely in the streets of all the large cities, simply because the tsar did not want to pronounce the word which would put an end to his sham autocracy and to the autocracy of his camarilla. Only towards the end of the summer could he be induced to make some concessions which at last took the shape of a convocation of a state’s Duma, announced in the manifesto of August 19 . In Part Four of “The Revolution in Russia,” perhaps the most interesting part of the essay, Kropotkin shows how the tide again began to turn in favour of the rebels when workers renewed their involvement in the revolutionary movement in October 1905, leading to a country-wide general strike. For Kropotkin and other anarchists, the October General Strike showed that the general strike advocated by anarchists and revolutionary syndicalists, but dismissed by Marxists as “general nonsense,” really was an effective “new weapon” in the revolutionary arsenal which had now “been tested and proved to work admirably.” Also important for Kropotkin was how the general strike spread across the country largely spontaneously, being “entirely a workingmen’s affair,” rather than the work of organized revolutionary parties. 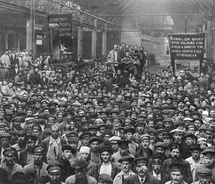 For anarchists, the 1905 Russian Revolution was a vivid illustration of the kind of far-reaching social revolution, from the bottom up, that they had been advocating since the inception of revolutionary anarchist movements in the late 1860s. General stupefaction and disdain are the only words to express the impression produced by this manifesto. To begin with, it was evident to anyone who knew something of human psychology that no assembly elected to represent the people could be maintained as a merely consultative body, with no legislative powers. To impose such a limitation was to create the very conditions for producing the bitterest conflicts between the crown and the nation. 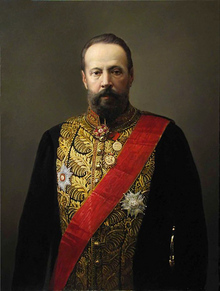 To imagine that the Duma, if it ever could come into existence in the form under which it was conceived by the advisers of Nicholas II, would limit itself to the functions of a mere consulting board, that it would express its wishes in the form of mere advices, but not in the form of laws, and that it would not defend these laws as such, was absurd on the very face of it. Therefore the concession was considered as a mere desire to bluff, to win time. It was received as a new proof of the insincerity of Nicholas II. But in proportion as the real sense of the Bulygin “Constitution” was discovered, it became more and more evident that such a Duma would never come together; never would the Russians be induced to perform the farce of the Duma elections under the Bulygin system. It appeared that under this system the city of St. Petersburg, with its population of nearly 1,500,000 and its immense wealth, would have only about 7,000 electors, and that large cities having from 200,000 to 700,000 inhabitants would have an electoral body composed of but a couple of thousand, or even a few hundred electors; while the 90,000,000 peasants would be boiled down, after several successive elections, to a few thousand men electing a few deputies. As to the nearly 4,ooo,ooo Russian workingmen, they were totally excluded from any participation in the political life of the country. It was evident that only fanatics of electioneering could be induced to find interest in so senseless a waste of time as an electoral campaign under such conditions. Moreover, as the press continued to be gagged, the state of siege was maintained, and the governors of the different provinces continued to rule as absolute satraps, exiling whom they disliked, public opinion in Russia gradually came to the idea that, whatever some moderate zemstvoists might say in favour of a compromise, the Duma would never come together. Then it was that the workingmen again threw the weight of their will into the contest and gave quite a new turn to the movement. A strike of bakers broke out at Moscow in October last, and they were joined in their strike by the printers. This was not the work of any revolutionary organization. 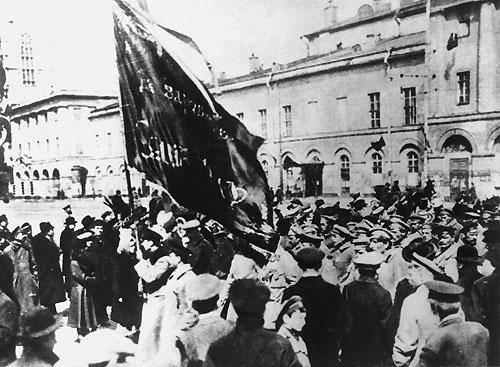 It was entirely a workingmen’s affair, but suddenly what was meant to be a simple demonstration of economic discontent grew up, invaded all trades, spread to St. Petersburg, then all over Russia, and took the character of such an imposing revolutionary demonstration that the autocracy had to capitulate before it. When the strike of the bakers began, troops were, as a matter of course, called out to suppress it. But this time the Moscow workingmen had had enough of massacres. They offered an armed resistance to the Cossacks. Some three hundred men barricaded themselves in a garret, and a regular fight between the besieged workingmen and the besieging Cossacks followed. The latter took, of course, the upper hand, and butchered the besieged, but then all the Moscow workingmen joined hands with the strikers. A general strike was declared. “Nonsense! A general strike is impossible!” the fools said, even then. But the workingmen set earnestly to stop all work in the great city, and fully succeeded. In a few days the strike became general. What the workingmen must have suffered during these two or three weeks, when all work was suspended and provisions became extremely scarce, one can easily imagine; but they held out. Moscow had no bread, no meat coming in, no light in the streets. All traffic on the railways had been stopped, and the mountains of provisions which, in the usual course of life, reach the great city every day, were lying rotting along the railway lines. No newspapers except the proclamation of the strike committees appeared. Thousands upon thousands of passengers who had come to that great railway center which Moscow is could not move any further, and were camping at the railway stations. Tons and tons of letters accumulated at the post offices, and had to be stored in special storehouses. But the strike, far from abating, was spreading all over Russia. Once the heart of Russia, Moscow, had struck, all the other towns followed. 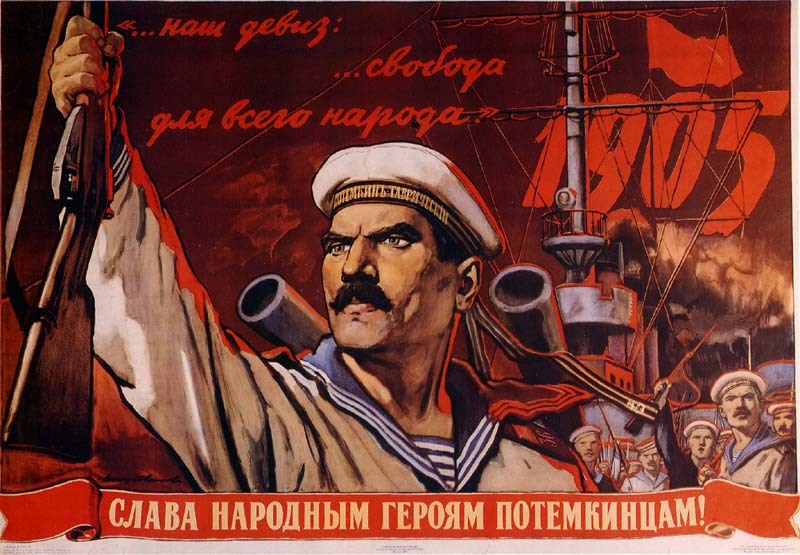 St. Petersburg soon joined the strike, and the workingmen displayed the most admirable organizing capacities. Then, gradually, the enthusiasm and devotion of the poorest class of society won over the other classes. The shop assistants, the clerks, the teachers, the employees at the banks, the actors, the lawyers, the chemists, even the judges gradually joined the strikers. A whole country had struck against its government, all but the troops; but even from the troops separate officers and soldiers came to take part in the strike meetings, and one saw uniforms in the crowds of peaceful demonstrators who managed to display a wonderful skill in avoiding all conflict with the army. In a few days the strike had spread over all the main cities of the empire, including Poland and Finland. Moscow had no water, Warsaw no fuel; provisions ran short everywhere; the cities, great and small, remained plunged in complete darkness. No smoking factories, no railways running, no tramways, no stock exchange, no banking, no theatres, no law courts, no schools. In many places the restaurants, too, were closed, the waiters having left, or else the workers compelled the owners to extinguish all lights after seven o’clock. In Finland even the house servants were not allowed to work before seven in the morning or after seven in the evening. All life in the towns had come to a standstill. And what exasperated the rulers most was that the workers offered no opportunity for shooting at them and re-establishing “order” by massacres. A new weapon, more terrible than street warfare, had thus been tested and proved to work admirably. (1)To grant the population the immutable foundations of civic liberty based on real inviolability of the person and freedom of conscience, speech, union, and association. (2) Without deferring the elections to the state Duma already ordered, to call to participation in the Duma, as far as is possible in view of the shortness of the time before the Duma is to assemble, those classes of the population now completely deprived of electoral rights, leaving the ultimate development of the principle of the electoral right in general to the newly established legislative order of things. (3) To establish it as an immutable rule that no law can come into force without the approval of the state Duma, and that it shall be possible for the elected of the people to exercise a real participation in the supervision of the legality of the acts of the authorities appointed by us. At the same time a general strike had also broken out in Finland. The whole population joined in supporting it with a striking unanimity; and as communication with St. Petersburg was interrupted, the wildest rumours about the revolution in the Russian capital circulated at Helsinki. Pressed by the Finnish population, the governor-general undertook to report to the tsar the absolute necessity for full concessions, and, the tsar agreeing with this demand, a manifesto was immediately issued, by which all repressive measures of the last few years, including the unfortunate manifesto of the year 1899, by which the Finnish Constitution had been violated, were rescinded, the Diet was convoked, and a complete return to the status quo ante Bobrikov was promulgated. What a pity for the future development of Russia that on this very same day an identical measure, establishing and convoking a Polish Diet at Warsaw, was not taken! How much bloodshed would have been saved! And how much safer the further development of Russia would have been, if Poland had then known that she would be able to develop her own life according to her own wishes! 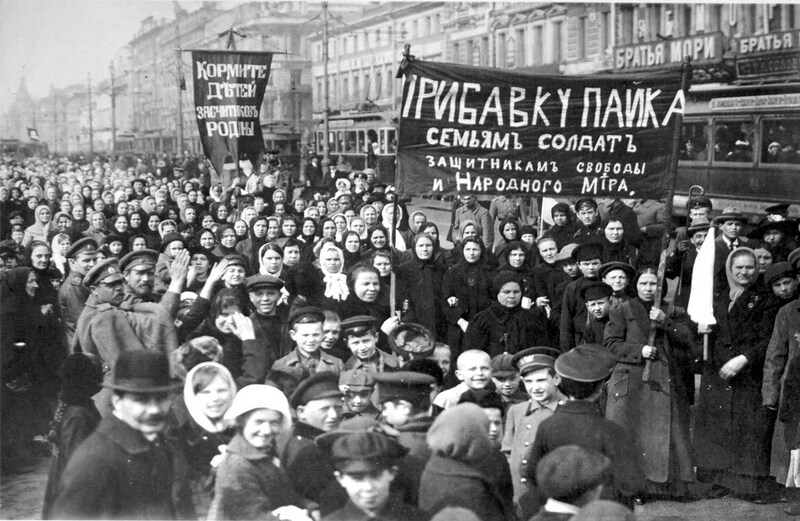 In Parts Five and Six of Kropotkin‘s essay, “The Revolution in Russia,” Kropotkin notes the hollowness of the reforms agreed to by the Russian autocracy in the face of the 1905 Russian Revolution, foreseeing that the “reforms” would ultimately prove unsuccessful in stemming the revolutionary tide, as similar measures had been during the French Revolution. Kropotkin was also quick to recognize the importance of the Workers’ Soviets, or Councils, that arose in St. Petersburg, and which were to play such an important role during the 1917 Russian Revolution. He illustrates the completely reactionary and counter-revolutionary role of the Russian Orthodox Church, particularly in inciting massacres and pogroms by the Cossacks and the “black guards,” proto-fascist groups of thugs recruited by the counter-revolutionaries. He denounces the “race hatred” incited by the autocracy to justify pogroms against the Jews, inter-ethnic and religious conflict, and attacks on revolutionaries, an approach later imitated by the Nazis in Germany. Yet despite the counter-revolutionary violence and repression, Kropotkin was right that as a result of the 1905 Russian Revolution, the autocracy already lay “mortally wounded,” with other revolutionary victories to follow. Count Witte having been invested on October 30 with wide powers as minister-president, and the further march of events undoubtedly depending to a great extent upon the way in which he will use his extensive authority, the question, “What sort of man is Witte?” is now asked on all sides. The present prime minister of Russia is often described as the Necker of the Russian revolution [a conservative politician during the French Revolution]; and it must be owned that the resemblance between the two statesmen lies not only in the situations which they occupy with regard to their respective monarchies. 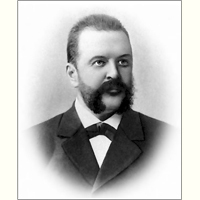 Like Necker, Witte is a successful financier, and he is also a “mercantilist”: he is an admirer of the great industries, and would like to see Russia a moneymaking country, with its Morgans and Rockefellers making colossal fortunes in Russia itself and in all sorts of Manchurias. But he has also the limited political intelligence of Necker, and his views are not very different from those which the French minister expressed in his work Pouvoir Exécutif published in 1792. Witte’s ideal is a liberal, half absolute and half constitutional monarchy, of which he, Witte, would be the Bismarck, standing by the side of a weak monarch and sheltered from his whims by a docile middle-class parliament. In that parliament he would even accept a score of labour members—just enough to render inoffensive the most prominent labour agitators and to have the claims of labour expressed in a parliamentary way. Witte is daring, he is intelligent, and he is possessed of an admirable capacity for work; but he will not be a great statesman because he scoffs at those who believe that in politics, as in everything else, complete honesty is the most successful policy. In the polemics which Herbert Spencer carried on some years ago in favour of “principles” in politics, Witte would have joined, I suppose, his opponents, and I am afraid he secretly worships the “almighty dollar policy” of Cecil Rhodes. In Russia he is thoroughly distrusted. 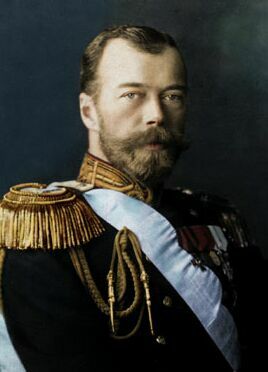 It is very probable that people attribute to him more power over Nicholas II than he has in reality, and do not take sufficiently into account that Witte must continually be afraid of asking too much from his master, from fear that the master will turn his back on him and throw himself at the first opportunity into the hands of his reactionary advisers, whom he certainly understands and likes better than Witte. But Witte, like his French prototype, has retained immensely the worship of bureaucracy and autocratic power, and distrust of the masses. With all his boldness he has not that boldness of doing things thoroughly, which is gained only by holding to certain fundamental principles. He prefers vague promises to definite acts, and therefore Russian society applies to him the saying: Timeo danaos et dona ferentes [beware of Greeks bearing gifts]. And if the refusal he has met with on behalf of all prominent liberals to collaborate with him has been caused by their complete disapproval of the policy which refuses home rule for Poland, there remains besides the widely spread suspicion that Witte is capable of going too far in the way of compromises with the palace party. At any rate, even the moderate zemstvoists could not agree—we learn now—with his policy of half measures, both as regards the popular representation, and even such a secondary question as the amnesty. He refused to accept universal suffrage and to grant a complete amnesty, upon which the zemstvo delegation was ordered to insist. That “straightforwardness and sincerity in the confirmation of civil liberty” which—the prime minister wrote—had to be accepted as binding for the guidance of his ministry, surely are not yet seen. 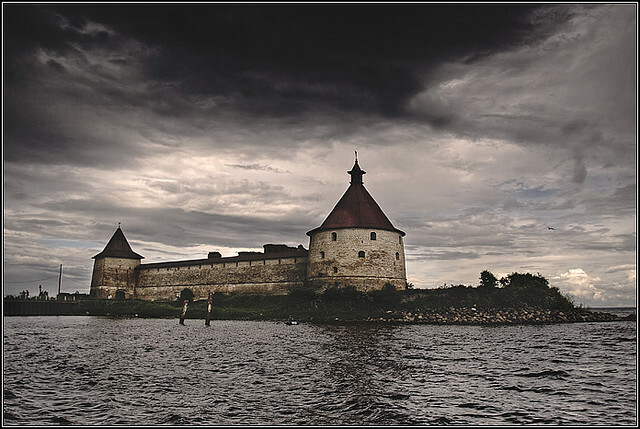 The state of siege not only continues to be maintained in many parts of Russia, but it has been spread over Poland; and as to the amnesty, its insincerity is such that it might be envied by Pobedonostsev. An honest amnesty is never couched in many words: it is expressed in four or five lines. But Witte’s amnesty is a long document written with an obvious intention of deceiving the reader as to its real tenor, and therefore it is full of references to numbers of articles of the code, instead of naming things by their proper names. Thousands of contests must arise, Russian lawyers say, out of this muddled document. At any rate, one thing is evident. Those who were confined at Schlusselburg since 1881-1886—immured in secrecy would be the proper term—and whose barbarous treatment is known to the readers of this review, will not be liberated, according to the terms of the amnesty. They will have to be exiled as posselentsy (“criminal exiles”) for another four years to Siberia, probably to its most unhealthy parts, before they are allowed to enter Russia! This, after a twenty-four years’ cellular confinement, in absolute secrecy, without any communication whatever with the outer world! As to those who were driven to desperate action by the police rule of Plehve, they all must remain for ten to twelve years more in the Russian bastille of Schlusselburg; the amnesty does not apply to them. And as regards the exiles abroad, they are offered the right to obtain certificates of admission to Russia from the Russian state police! All over the world, each time that a new departure has been made in general policy, an honest general amnesty was granted as a guarantee of good faith. Even that pledge was refused to Russia. And so it is all around. All that has hitherto been done are words, words, and words. And every one of these words can be crossed with a stroke of the pen, just as the promises of a constitution given by the Austrian emperor after the Vienna revolution of March 13, 1848 were cancelled a few months later, and the population of the capital was massacred as soon as its revolutionary spirit cooled down. Is it not the same policy that is coveted at Tsarskoe Selo? Unfortunately, the first step in the way of reaction has already been made by proclaiming the state of siege in Poland. The first victory of the Russian nation over autocracy was met with the wildest enthusiasm and jubilation. Crowds, composed of hundreds of thousands of men and women of all classes, all mixed together, and carrying countless red flags, moved about in the streets of the capitals, and the same enthusiasm rapidly spread to the provinces, down to the smallest towns. True that it was not jubilation only; the crowd also expressed three definite demands. 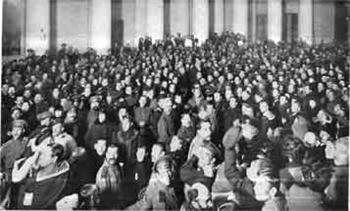 For three days after the publication of the manifesto in which autocracy had abdicated its powers, no amnesty manifesto had yet appeared, and on November 3, in St. Petersburg, a crowd a hundred thousand men strong was going to storm the House of Detention, when, at ten in the evening, one of the Workmen’s Council of Delegates [Soviet] addressed them, declaring that Witte had just given his word of honour that a general amnesty would be granted that same night. The delegate therefore said: “Spare your blood for graver occasions. At eleven we shall have Witte’s reply, and if it is not satisfactory, then tomorrow at six you will all be informed as to how and where to meet in the streets for further action.” And the immense crowd—I hold these details from an eyewitness—slowly broke up and dispersed in silence, thus recognizing the new power—the labour delegates—which was born during the strike. Two other important points, beside amnesty, had also to be cleared up. During the last few months the Cossacks had proved to be the most abominable instrument of reaction, always ready to whip, shoot, or bayonet unarmed crowds, for the mere fun of the sport and with a view to subsequent pillage. Besides, there was no guarantee whatever that at any moment the demonstrators would not be attacked and slaughtered by the troops. 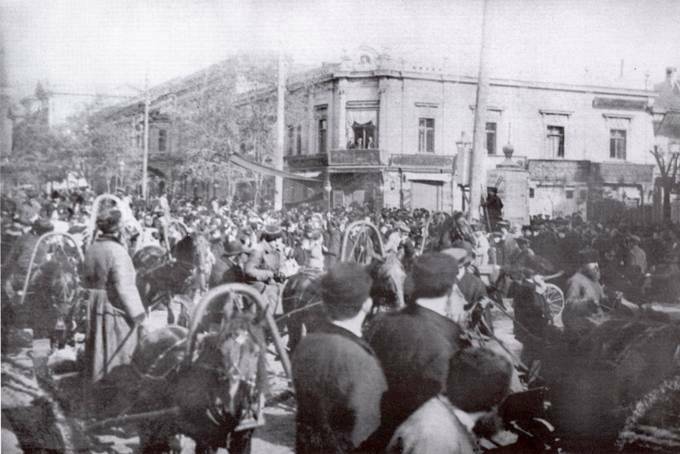 The people in the streets demanded therefore the withdrawal of the troops, and especially of the Cossacks, the abolition of the state of siege, and the creation of popular militias which would be placed under the management of the municipalities. It is known how, first at Odessa and then all over Russia the jubilant crowds began to be attacked by bands, composed chiefly of butcher assistants, and partly of the poorest slum dwellers, sometimes armed, and very often under the leadership of policemen and police officials in plain clothes; how every attempt on behalf of the radical demonstrators to resist such attacks by means of revolver shots immediately provoked volleys of rifle fire from the Cossacks; how peaceful demonstrators were slaughtered by the soldiers after some isolated pistol shot—maybe a police signal—was fired from the crowd; and how finally at Odessa an organized pillage and the slaughter of men, women, and children in some of the poorest Jewish suburbs took place, while the troops fired at the improvised militia of students who tried to prevent the massacres or to put an end to them. In Moscow, the editor of the Moscow Gazette, Gringmut, and part of the clergy, stimulated by a pastoral letter of Bishop Nikon, openly preached “to put down the intellectuals by force,” and improvised orators spoke from the platform in front of the Iberia Virgin, preaching the killing of the students. The result was that the university was besieged by crowds of the “defenders of order,” the students were fired at by the Cossacks, and for several nights in succession isolated students were assailed in the dark by the Moscow Gazette men, so that in one night twenty-one were killed or mortally wounded. An inquest into the origin of these murders is now being made by volunteer lawyers; but this much can already be said. If race hatred has played an important part at Odessa and in other southern towns, no such cause can be alleged at Moscow, Tver (the burning of the house of the zemstvo), Tomsk, Nizhni Novgorod, and a great number of towns having a purely Russian population. And yet outbreaks having the same savage character took place in all these towns and cities at about the same time. An organizing hand is seen in them, and there is no doubt that this is the hand of the Monarchist party. It sent a deputation to Peterhof, headed by Prince Shcherbatov and Count Sheremetev, and after the deputation had been most sympathetically received by Nicholas II, they openly came forward in the Moscow Gazette and in the appeals of the bishops Nikon and Nikandr, calling upon their sympathizers to declare an open war on the radicals. Of course it would be unwise to imagine that autocracy, and the autocratic habits which made a little tsar of every police official in his own sphere, would die out without showing resistance by all means, including murder. The Russian revolution will certainly have its Feuillants and its Muscadins. And this struggle will necessarily be complicated in Russia by race hatred. It has always been the policy of the Russian tsardom to stir national hatred, setting the Finns and the Karelian peasants against the Swedes in Finland, the Letts against the Germans in the Baltic provinces, the Polish peasants (partly Ukranian) against the Polish landlords, the Orthodox Russians against the Jews, the Musulmans [Muslims] against the Armenians, and so on. Then, for the last twenty years it has been a notable feature of the policy of Ignat’ev, and later on of Plehve, to provoke race wars with a view of checking socialist propaganda. And the police in Russia have always taken advantage of all such outbreaks for pilfering and plundering… Consequently, a few hints from above were enough—and several reactionary papers and two bishops went so far as to openly give such hints—to provoke the terrible massacres at Odessa and the smaller outbreaks elsewhere. Such conflicts between the representatives of a dark past and the young forces representing the future will certainly continue for some time before the mighty floods raised by the storm of the revolution will subside. The revolution in England lasted from 1639 to 1655, that of France from 1788 till 1794, and both were followed by an unsettled period of some thirty years’ duration. So we cannot expect that the Russian revolution should accomplish its work in a few months only. One extremely important feature has, however, to be noted now. Up to the present moment, “bloodshed has come, not from the revolutionists, but from the defenders of absolutism.” It is estimated that more than twenty-five thousand persons have already been killed in Russia since January last. But all this mass of murders lies on the side of the defenders of autocracy. The victory over absolutism which compelled it to abdicate was obtained by a strike, unique in the annals of history by its unanimity and the self-abnegation of the workers; but no blood was shed to win this first victory. The same is true of the villages. It may be taken as certain that the landlord ownership of the land has already sustained a blow which renders a return to the status quo ante in land ownership materially impossible. And this other victory—a very great one, in my opinion—is being obtained again without bloodshed on behalf of the revolting peasants. If blood is shed, it is shed by the troops called in for the defence of the monopoly in land—not by those who endeavour to get rid of it. As to the peasants, they have even pronounced themselves against retaliation. 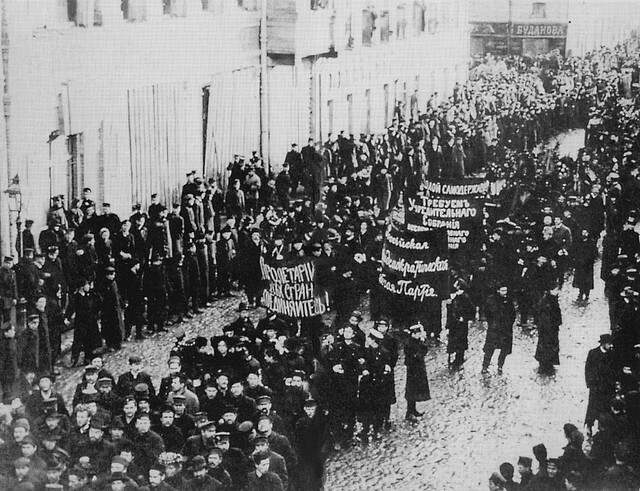 As to the powers of the labour organization, they are best seen from the fact that while the bureaucrat lawyers are still concocting some crooked press law, the workingmen have abolished preventive censorship in St. Petersburg by publishing a short-worded resolution in their clandestine daily, the Isvestia of the Council of Labour Delegates. “We declare,” they said, “that if the editor of any paper continues to send his sheet to the censor before issuing it, the paper will be confiscated by us in the streets, and the printers will be called out from the printing office (they will be supported by the strike committee). If the paper continues nevertheless to appear, the scabs will be boycotted by us, and the presses will be broken.” This is how preliminary censorship has ceased to exist in St. Petersburg. The old laws remain, but de facto the daily press is free. Many years ago the general strike was advocated by the Latin workingmen as a weapon which would be irresistible in the hands of labour for imposing its will. The Russian revolution has demonstrated that they were right. Moreover, there is not the slightest doubt that if the general strike has been capable of forcing the centuries-old institution of autocracy to capitulate, it will be capable also of imposing the will of the labourers upon capital, and that the workingmen, with the common sense of which they have given such striking proof, will find also the means of solving the labour problem, so as to make industry the means not of personal enrichment but of satisfying the needs of the community. That the Russian revolution will not limit itself to a mere reform of political institutions, but like the revolution of 1848, will make an attempt, at least, to solve the social problem, has always been my opinion. Half a century of socialist evolution in Europe cannot remain without influence upon the coming events. And the dominant position taken by labour in the present crisis seems to yield support to that foresight. How far the social change will go, and what concrete forms it will take, I would not undertake to predict without being on the spot, in the midst of the workers; but steps in that direction are sure to be made. To say that Russia has begun her great revolution is no longer a metaphor or a prophecy; it is a fact. And one is amazed to discover how history repeats itself: not in the events, of course, but in the psychology of the opposed forces. The governing class, at any rate, has learned nothing. They remain incapable of understanding the real significance of events which are screened from their eyes by the artificiality of their surroundings. Where a timely yielding, a frank, open-minded recognition of the necessity of new forms of life would have spared the country torrents of blood, they make concessions at the last moment, always in a half-hearted way, and always with the secret intention of soon returning to the old forms. Why have they massacred at least twenty-five thousand men during these ten months, when they had to recognize in October what they refused to recognize last December? Why do they continue repression and provoke new massacres, when “they will have to recognize in a few months hence universal suffrage as the basis of representative government in Russia, and the legislative autonomy of Poland as the best, the only possible means for keeping the two countries, Russia and Poland, firmly linked together,” just as they were compelled, after having set all the country on fire, to recognize that the honest recognition of Finland’s autonomy was the only means of maintaining her bonds with Russia. But no, they will not recognize what is evident to everyone as soon as he frees himself from the fools’ paradise atmosphere of the St. Petersburg bureaucracy. They will stir up the bitterest civil wars. Happily enough, there is a more hopeful side to the Russian revolution. The two forces which hitherto have played the leading part in the revolution—namely, the workingmen in the towns, fraternizing with the younger “intellectuals,” and the peasants in the countryside—have displayed such a wonderful unanimity of action, even where it was not concerted beforehand, and such a reluctance for useless bloodshed, that we may be sure of their ultimate victory. 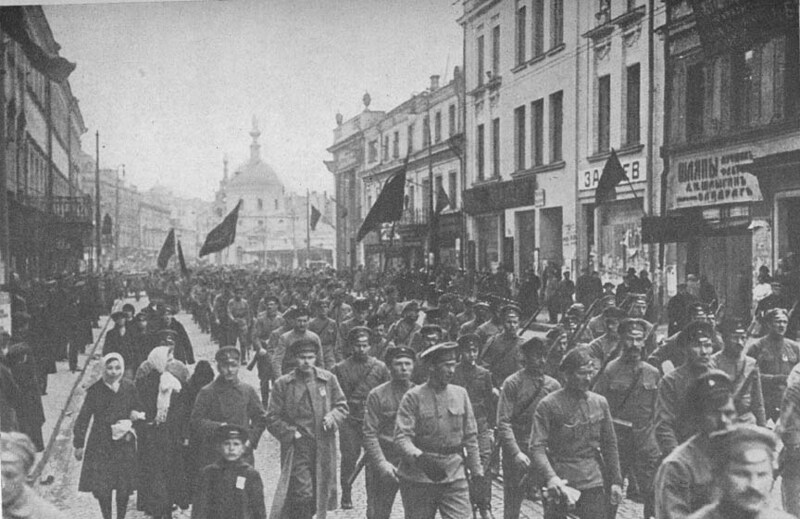 The troops have already been deeply impressed by the unanimity, the self-sacrifice, and the consciousness of their rights displayed by the workmen in their strikes; and now that the St. Petersburg workmen have begun to approach in a spirit of straightforward propaganda those who were enrolled in the “black gangs,” that other support of autocracy will probably soon be dissolved as well. The main danger lies now in that the statesmen, enamoured of “order” and instigated by timorous landlords, might resort to massacres for repressing the peasant rebellions, in which case retaliation would follow to an extent and with consequences which nobody could foretell. The first year of the Russian revolution has already proved that there is in the Russian people that unity of thought without which no serious change in the political organization of the country would have been possible, and that capacity for united action which is the necessary condition of success. One may already be sure that the present movement will be victorious. The years of disturbance will pass, and Russia will come out of them a new nation; a nation owning an unfathomed wealth of natural resources and capable of utilizing them; ready to seek the ways for utilizing them in the best interest of all; a nation averse to bloodshed, averse to war, and ready to march towards the higher goals of progress. One of her worst inheritances from a dark past, autocracy, lies already mortally wounded, and will not revive; and other victories will follow.